Are you ready for a visual buffet of all things vintage, industrial, antique, linen and lovely?!?! Then let's take a peak inside my Head Over Heels pick this week... ABC Home in New York City! ABC Home is a higher-end home store that sits in the Flat Iron District. It is HUGE! Six floors of delicious home goodies to oogle at (or purchase if you've got a lot of extra dough to throw around). I absolutely love looking at every little thing in this store! I adore the way they mix french antique style furniture and industrial elements. I about DIED when I saw that linen striped armchair....Swoon! Oh, and again when I saw this linen bench with Gothic text! The armoires and tufted sofas were so elegant. This tufted ottoman was amazing as well! It was huge! Loved these metal chairs! I have seen them at Pottery Barn too. I have been looking for them at antique stores, but have yet to find any. I am wondering if any actual antiques of this style chair exist? In case anyone out there is looking for other random things to do with vintage luggage, guess you can display them on a shelf. (Sarcasm Font) Ha! But it did look cool in the store. These cute little hearts had lavender inside. Then this elegant chandelier enclosed in an industrial fixture. So unique! 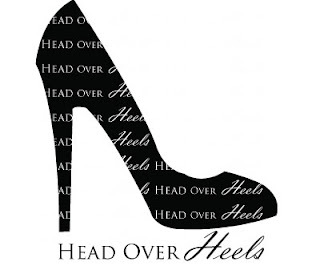 So, are you Head Over Heels for ABC Home just like I am? Hope you enjoyed all the photos, it was fun to revisit and share! Hope to see you again tomorrow, we will be sharing a very special post!